This post describes how users, groups and contact are provisioned in Office 365 from the on-premises Active Directory. By using DirSync, these objects are created in and synchronized to Office 365. Without an Exchange Server and Exchange Management tools in place, it is not always obvious how these objects should be created. The following sections describe the procedures you can follow without Exchange or the Exchange management tools in place. The sections below only specify the basic actions you need to perform in Active Directory to have the object appear in the right place in Office 365 (user, security group, mailbox, distribution group, contact). Note that almost all properties of these objects need to be set in Active Directory. If you want to hide a distribution group from the address book or you want to configure moderation for a distribution group, you have to know the property in Active Directory that’s responsible for the setting, set the value and perform directory synchronization. You will also need to upgrade the Active Directory schema with Exchange Server 2010 schema updates. You cannot use the Exchange Server 2010 System Manager without having at least one Exchange Server 2010 role installed on-premises. 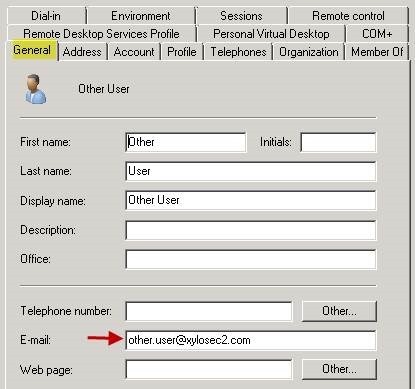 Create a regular user account in Active Directory. This user account will be replicated by DirSync and it will appear in the Users list in the portal (https://portal.microsoftonline.com). User accounts without a mailbox (or any other license) can be used in Office 365 to grant permissions such as Billing Administrator or Global Administrator. A user account like this is typically used to create a DirSync service account. What if the user needs extra SMTP addresses? 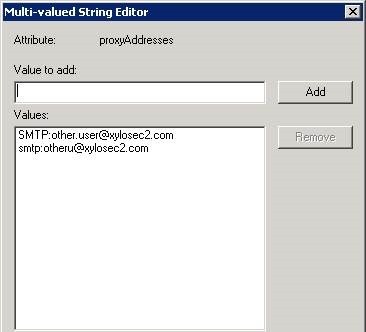 You cannot set extra SMTP addresses in Exchange Control Panel (or Remote PowerShell) because the object is synchronized with DirSync. In the proxyAddresses field, make sure that you also list the primary SMTP address with SMTP: (in uppercase) in front of the address. Secondary addresses need smtp: (in lowercase) in front of the address. When a user is created in AD, you can use the additional tabs this tool provides to set all needed properties at once. Set proxyAddresses manually or with the MessageOps add-in to specify additional e-mail addresses (with smtp: in the front) and make sure you also specify the primary e-mail address with SMTP: in the front. Assign an Exchange Online license to the user. A mailbox will be created with the correct e-mail addresses. Create a security group in Active Directory. The group will be synchronized by DirSync and appear in the Security Groups in the portal. The group will not appear in the Distribution Groups in Exchange Online (obviously). In addition to the e-mail address, the group object also needs a display name (displayname attribute). If the distribution group in AD has an e-mail address and a display name, the group will appear in the Distribution Groups list in Exchange Online after synchronization. 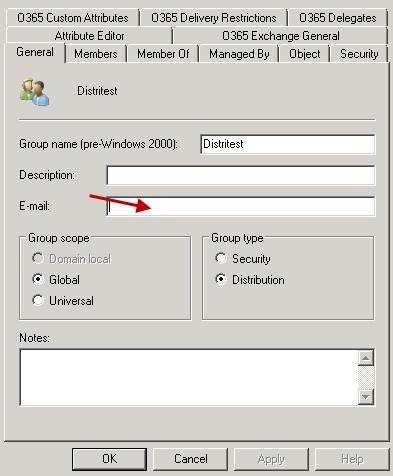 Note that specifying members and alternate e-mail addresses has to be done in the local Active Directory as well. If you have installed the MessageOps add-in, you can set easily set those properties. You can stamp the properties manually or use the MessageOps add-in to set these properties easily. Create a contact object in Active Directory. In the properties of the created object, fill in the E-mail field in the General tab. During a recent migration project, we migrated several mailboxes to Office 365 using the staged migration approach. Naturally, during the migration, users that had been migrated still sent meeting invites to on-premises users and meeting rooms. The problem was that meeting invites were actually received as clear text and stripped of the necessary attributes that make it a meeting request. The on-premises server was Exchange Server 2003 SP2. 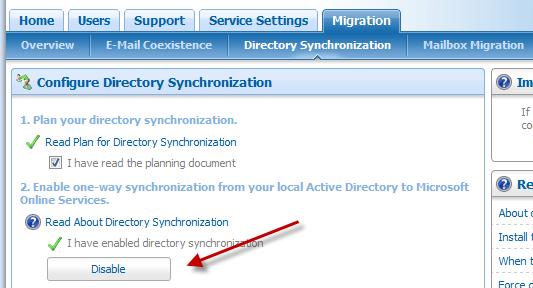 As you might know, during a staged migration, DirSync creates MEUs (mail-enabled users) in the cloud. These MEUs actually represent on-premises users that have not been migrated yet and they make sure that the global address list in Office 365 matches the on-premises global address list. After running this command, cloud users could successfully send meeting requests to on-premises users. Hope it helps! If you have some experience with BPOS or the Office 365 Beta, you know there’s a tool called DirSync that allows you to synchronize your Active Directory with Microsoft’s Online Services. During a course last week, I was asked if you can use DirSync temporarily to sync users, contacts and groups and, after migration, turn it off. Microsoft has provided more details about Office 365 and the different identity options in a service description document (link at the bottom of this post). With BPOS, there was only one type: cloud identity. Users had to logon using a Sign-In Assistant that stored the cloud credentials (name and password) and used those credentials to sign in in the background. For larger organizations, the Sign-In Assistant was a pain to install and manage so it’s a good thing it is going away. Note that it is required to install some components and updates on user’s workstations if rich clients are used to access Office 365. Although you can manually install these updates, the Office 365 Desktop Setup package does all that is needed. Office 365 Desktop Setup was formerly called the Microsoft Online Services Connector. Office 365 Desktop Setup supports Windows XP (SP2) and higher. 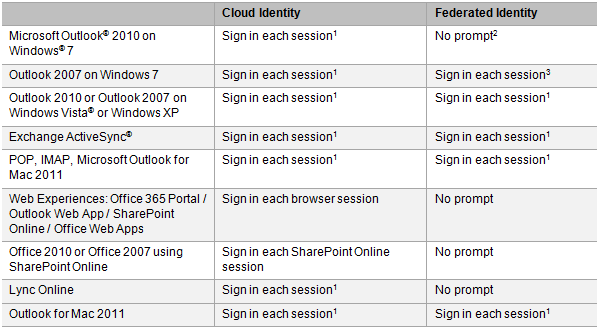 Office 365 supports two-factor authentication if you implement SSO with Active Directory Federation Services 2.0. There are two options to enforce two-factor auth: on the ADFS 2.0 proxy logon page or at the ForeFront UAG SP1 level. Note that the synchronization tool still does not support multiple forests. The synchronization tool is required in migration scenarios like rich coexistence, simple coexistence and staged migration with simple coexistence. The full details can be downloaded from the Microsoft website. If you are involved in Office 365 projects, this is considered required reading! Microsoft has recently published updated Office 365 Service Descriptions at http://www.microsoft.com/downloads/en/details.aspx?FamilyID=6c6ecc6c-64f5-490a-bca3-8835c9a4a2ea. The storage pool starts at 10GB with 500MB of extra storage per user account (talking about enterprise user accounts here). Maximum amount of storage is 5TB. File upload limit is 250MB. Storage can be allocated to a maximum of 300 site collections. The maximum amount of storage for a site collection is 100GB. My Sites are available and each My Site is set at 500MB (this is not the 500MB noted above, in essence this is extra storage for each user’s personal data). A My Site is not counted as a site collection. In other words, you can have 300 normal site collections and many more My Sites. Extra storage can be purchased (as before) at $2,5USD/GB per month. When it comes to external users (for extranet scenarios), the document states that final cost information is not available yet. It is the intention of Microsoft to sell these licenses in packs. Check out the SharePoint Online service description for full details. After the snapin is loaded, you can use the Start-OnlineCoexistenceSync cmdlet to start a synchronization run. Although I have not yet seen the next version of DirSync for use with Office 365, I presume that the above cmdlet will still be available since the DirSync tools will be very similar. Note that there are no cmdlets to create contacts and distribution lists in the Exchange Online global address lists. You can also see that these cmdlets are specifically created for use with Exchange Online in BPOS and that they have no relation at all with Exchange Server 2007 or Exchange Server 2010 cmdlets in an on-premise solution. To fix those issues and provide many more options, Exchange Online in Office 365 will actually allow full use of Exchange Server 2010 SP1 cmdlets over the Internet. Naturally, not all cmdlets will be available and some cmdlets will not support all parameters. The tool provides easy access to allmost all the available PowerShell cmdlets using the above GUI. Highly recommended! Exchange Online, standalone or as part of BPOS (Business Productivity Online Suite), always comes with antivirus and anti-spam protection delivered by Forefront Online Protection for Exchange or FOPE. Mails are always scanned for viruses and, depending on your settings, checked for spam. As a BPOS administrator you can control the anti-spam checking behavior by configuring safe and blocked senders in the BPOS Administration Center. E-mail addresses, IP addresses or domains added to the safe senders for instance are not checked for spam by the FOPE infrastructure. When e-mail is marked as spam, it is held by FOPE. 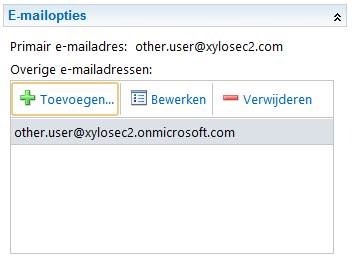 By default, a BPOS user gets an e-mail every three days (from FOPE) with a list of e-mails marked as spam. The user can then decide to move the e-mail to the inbox. You can initially ask that the BPOS administration account you are using is granted access to both. From the FOPE administration website, you can add other users so that they have access to their quarantine. 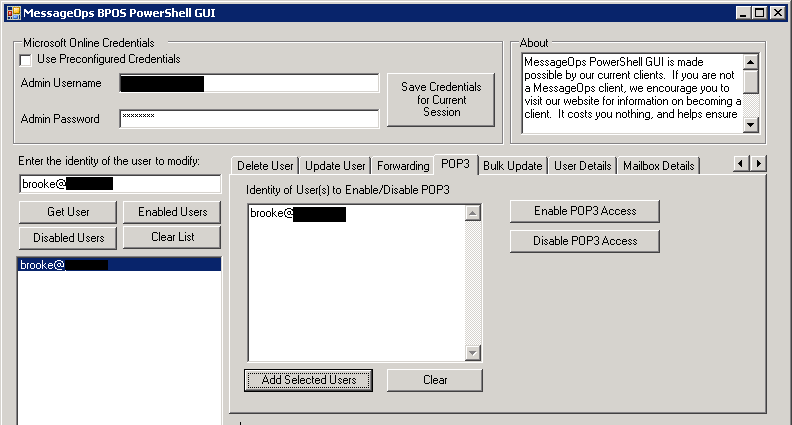 Note that the password to access FOPE admin and quarantine is different from the BPOS password! The user can easily select the e-mails that are not spam and move them to the inbox (or mark them as not spam). If we look forward to how things will be in Office 365, administrators will have more control over the settings in FOPE. That, for sure, will be a welcome addition to the capabilities of Exchange Online and the administrative control customers will have over it.